Had some fun putting this video together for Field & Stream and its Facebook page, Hookshots. This vid serves as a reminder that pike fishing is an option while most of our area waters are running high and fast. In fact, the rivers may be ripping along at Mach III and most trout have their heads down, but the backwaters and sloughs are just right for pike, with mostly stagnant water warming each day. Look for these beasts on the Clark Fork, Bitterroot, Clearwater, and Flathead rivers, to name only a few places where they can be found. Pishkin Reservoir is another great option. Use heavy tippet in the 20-to 30-pound range or go with a wire leader. 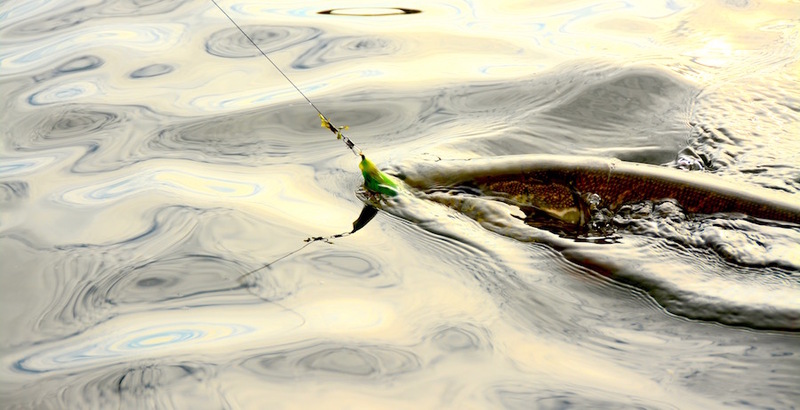 Rubber tail imitations get strikes, but even trout streamers work on these aggressive fish. Bring jaw spreaders and long forceps or pliers . . . or stand to get bit. This entry was posted in Montana, Videos and tagged fly fishing for pike, Montana pike, where to catch pike in Montana. Bookmark the permalink. 2) DON’T FORGET THE DEET!! Some of the worst mosquitoes in the lower 48. I also use latex gloves to protect my fly line, which, of course, is almost instantly trashed by deet. Also, I recently heard from Rod Duty, the game warden at Pishkun, that the years-long access fight is over. You can once again get there from the Augusta area without having to go all the way to Choteau and double back. Just saw this. Thanks for the update Jim. Hope you’re summer backpacking is going great. Say hi to the Bob for me. Heading up to Pishkun tomorrow (Monday). Still too much smoke in the Bob for this asthmatic.